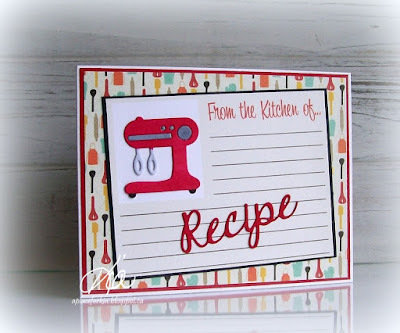 I am hostess for the Clean and Simple Challenge at Splitcoaststampers today, and this is my sample card I made. The challenge is all about the "Backgrounds." I did a Stencil Monoprint for my background using Tim Holtz Distress Inks and water on watercolour paper. I also did one on 110lb Neenah cardstock and like that look too, it is sharper than it is on the watercolour paper, but I like the rougher look. 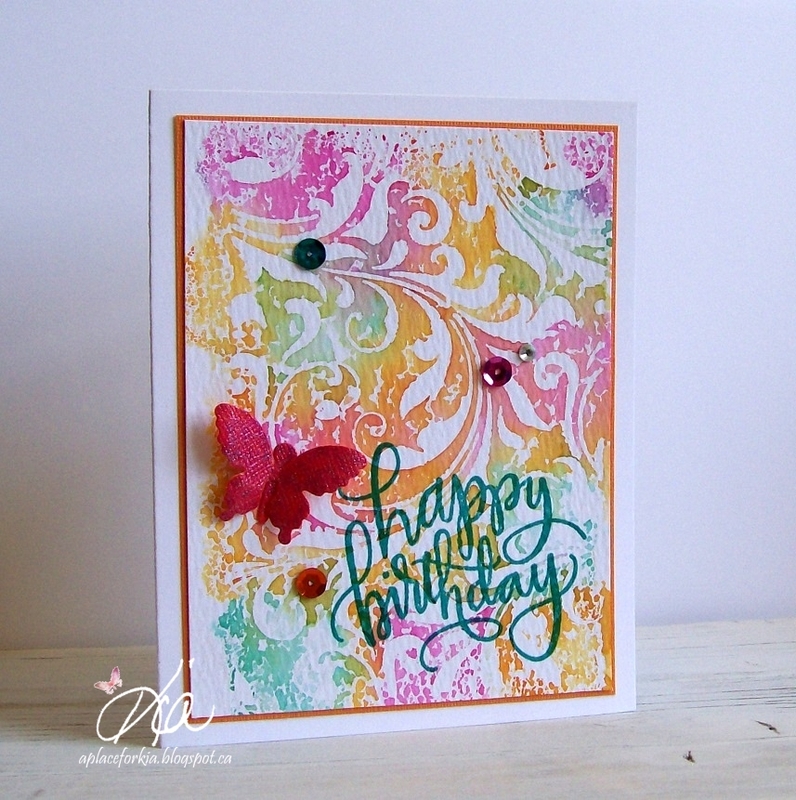 I stamped my sentiment at least 5 times - thank goodness for my MISTI, and added my butterfly from Frantic Stamper that I coloured using Martha Stewart Glitter Markers in a bright pink coloured on the orange cardstock, it looks yummie! I added a few sequins and a crystal to finish. I had so much fun making this card and hope you enjoy it too. 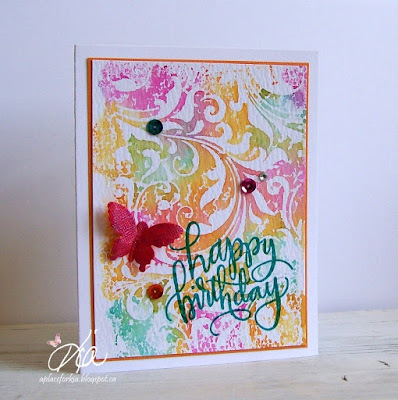 Products: Tim Holtz Flourish Stencil, Tim Holtz Distress Inks, Frantic Stamper Petitie Butterflies, Simon Says Stamp Big Scripty Greetings, Sequins, Crystal. Products: Memory Box Honey Comb Stencil, Stamplorations Noteworthy, Stampendous PenPattern Butterflies Stamp Set, Stampendous Butterfly Die Set, Tim Holtz Distress Inks. I did this card for the Inspiration Challenge at Splitcoaststampers where we visited a Pinterest Board called Birds of a Feather. Take a look if you enjoy birds, which I do. I inked my stamp using doCraft Markers and spritzed with water. Once stamped I dragged some of the colour in with my aqua brush, being quick about it as I was on cardstock. I really like the look, very Clean and Simple. I finished by stamping my sentiment using TH Distress Ink Peacock Feathers - seemed appropriate to me! Thanks for having a look today. 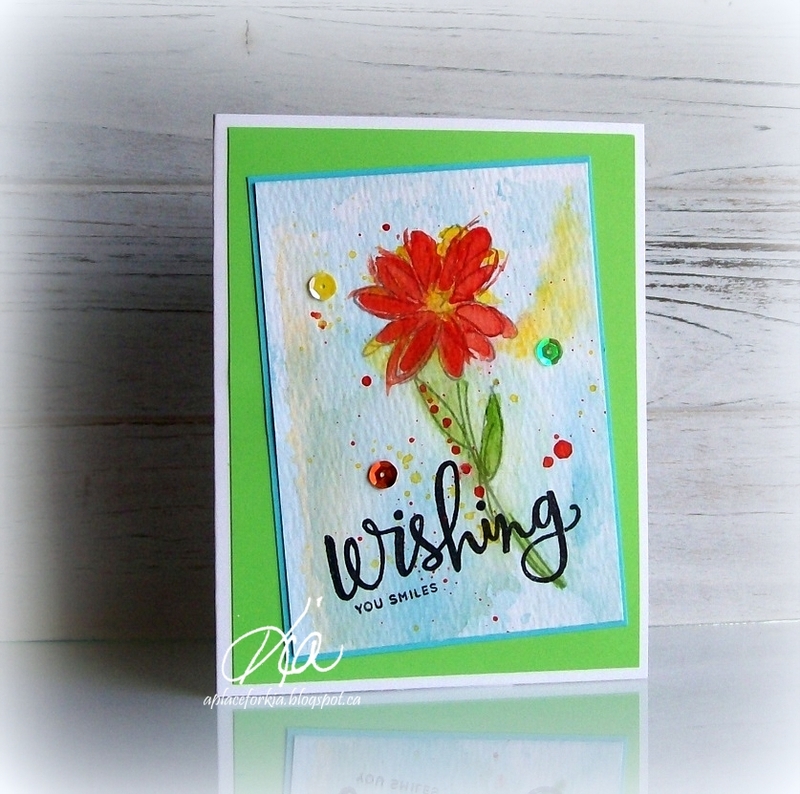 Products: WPlus9 Fiona and Flora, Stamplorations, Sequins, doCraft Markers, TH Distress Inks, Sequins, Recollections and Bazzill Cardstock. 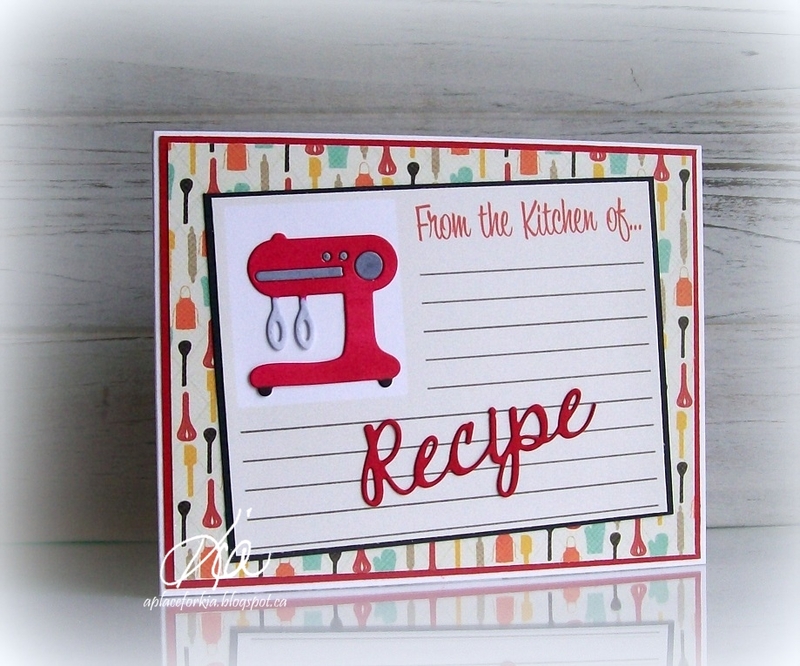 I made this card for the Clean and Simple Challenge at Splitcoaststampers. When I was making it, it was snowing where I live. I think we are all a little sick of the weather we are getting, and that was my jumping off point for this card. I stenciled my background in bright cheery soft pastels using my Memory Box Honey Comb Stencil. I then inked my image and spritzed with water very lightly, so as not to disturb the ink on my stenciled layer. For a little sparkle I added some Wink of Stella to the leaves at the leaf axil. The challenge was to use chipboard, for which I have "zero". So I die cut my smile die 5 times in 120lb cardstock and took great care gluing them together to make sure all was lined up as it should be. I matted with a very pale green and added some sequins and gems to finish. 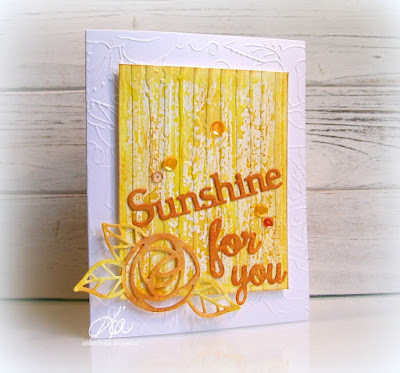 Products: Memory Box Honey Comb Stencil; Designs by Ryn Leafy Branch; Simon Says Stamp Smile Circle; Tim Holtz Distress Inks Mustard Seed, Picked Raspberry, Shabby Shutters, Mowed Lawn; Sequins, Crystals. Products: Deep Red Weathered Wall; Frantic Stamper Scribble Roses; Frantic Stamper Sunshine Sentiment; Frantic Stamper Accessory Words 2 & 3; Ecstasy Craft Roses Embossing Folder; Cuttlebug Distress Stripes Embossing Folder; Sequins; Fun Foam; Tattered Angels Glimmer Mist; All inks Tim Holtz Distress Inks. 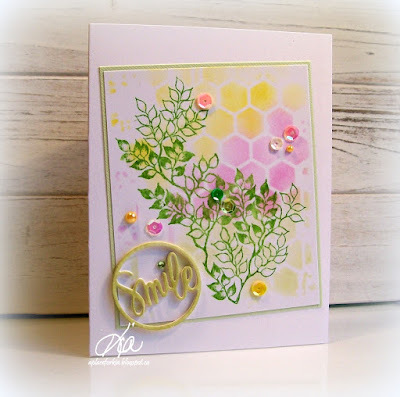 The colour challenge at Splitcoaststampers today is called Pink Pool in the Meadow. 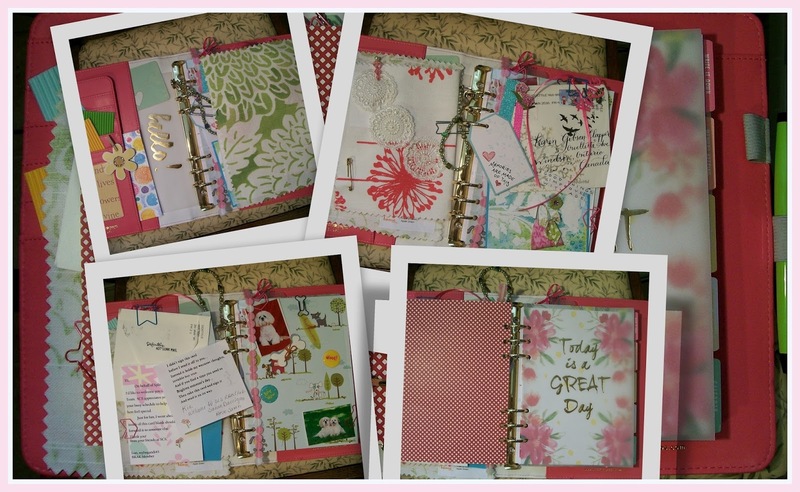 I wanted to do something different but it seems I am missing products I need for some of the techniques I want to try. I decided that I would give Loll Thompson's Faux Mother of Pearl technique a try, but I was missing the Acrylic Frost Paint, so I opted to use Fresco Finish instead. Loll uses plastic wrap to apply the paint, but I have a heavy hand, so I used my duster brush. I first brushed on the shabby shutters ink to my duster, then dipped in the Fresco Finish to apply to my cardstock. Once dry, I sponged on the evergreen and worn lipstick. For my butterfly I sponged shabby shutters on some cardstock, then die cut and stamped my butterfly using the evergreen ink. I then applied the Fresco Finish to the entire butterfly for some more shine. To put my card together, I used stitched border dies on my background piece, did some white matting with one piece being long enough for my sentiment, which I stamped in the evergreen. I styled my butterfly before attaching, and added some sequins and crystals to finish. Thanks for having a look. 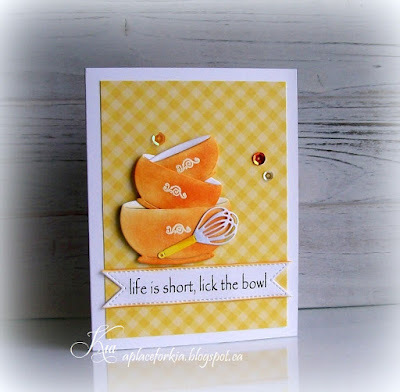 I did this card last week playing along with the Inspiration Challenge at Splitcoaststampers. It is what I call a loose watercolour. 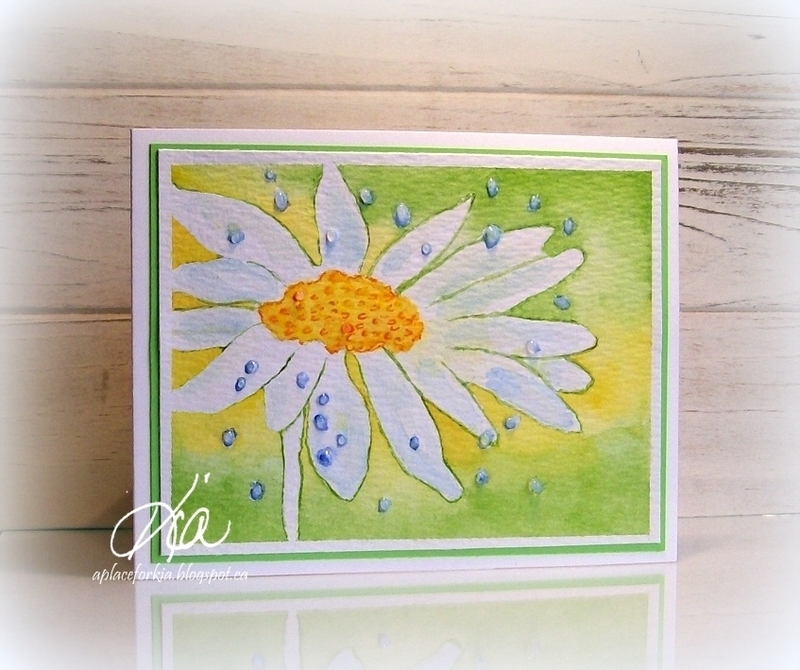 After taking the picture and uploading at SCS I thought I should have gone over the daisy lines for more definition. So, I did and took a second picture, which is this one. You can see the original Here It is a subtle change, but I like it better and must remember that in the future.